This interview was previously published in Sculpture magazine, July/August issue, pp. 36-41. Nnenna Okore. Anyanwu (The Sun in Igbo) series, (2008). Clay and rope. 120" x 130" x 120". Installation view at Tall Grass Arts Association gallery, Park Forest, Illinois, USA. Sometimes an artist’s use of materials is in itself political, as in the case of Nnenna Okore. Born in Australia and raised in Nsukka, a town in southeastern Nigeria, she explores a range of artistic materials and influences, creating installations and sculptures made of clay and found as well as handmade paper. Her striking forms emphasize the art-making process and craftsmanship, while her reuse of materials subtly pits extravagant wealth (and waste) against creative adaptation of available materials by the less fortunate. After studying painting at the University of Nigeria in Nsukka, Nnenna Okore pursued advanced studies in sculpture at the University of Iowa. Over the past decade, she has had a number of solo exhibitions in Nigeria, at the October Gallery in London, and at a variety of university galleries across the United States. Her works have also appeared in a wide range of group exhibitions, including the 2006 Dakar Biennale in Senegal, the Joburg Art Fair in South Africa, and the São Paulo Biennial in Brazil in 2010, as well as a variety of art spaces in France, India, Mexico, and Taiwan. The following are excerpts of my interview of Nnenna Okore. R.J. Preece: You use a rather rich range of materials in your work. How did this come about? 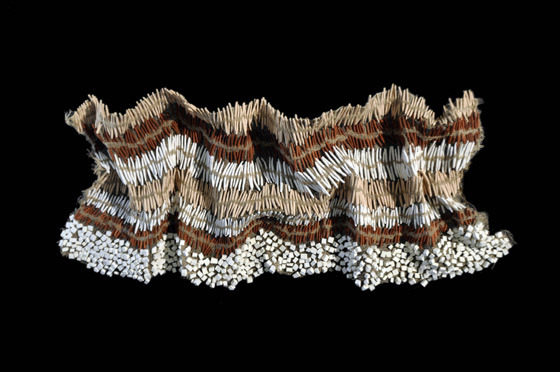 Nnenna Okore: My materials, which include paper, wool, sticks, and clay, are familiar, reusable objects from my immediate surroundings. When I work with a material, I set out to showcase its range of possibilities and textures and its new identity or meaning. From a very tender age, I had a strong sensibility toward materials. Growing up in Nigeria really helped to develop my consciousness because I was exposed to a richly tactile, colorful, and vibrant atmosphere. For most people living in my vicinity, dilapidated adobe houses with zinc roofing, firewood piled up against broken structures, or people clad in ragged clothes were commonplace. But, for me, these scenes were bewildering and captivating. For some reason, I have always been drawn to what others might consider crude and unsightly settings. I was also enamored of the hilly and rugged Nsukka terrain, which possesses the most jarring vegetative landscapes. I am trapped in these memories, and my use of materials is a means to reflect my past and present experiences. Nnenna Okore. Egwu Ukwu (Graceful hip dance in Igbo), (2009). 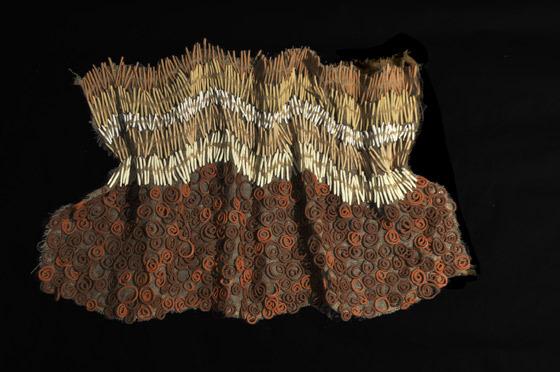 Clay and burlap, 30" x 65" x 7". R.J. Preece: Would you describe your approach to art-making as intellectual, or is there an emotional aspect as well? Nnenna Okore: There is certainly an intellectual side to my approach, especially when discussing my work formally or conceptually. However, I believe that my processes are much more rooted in emotions and habits derived from everyday experiences. I am not fixated on a desired visual outcome; I engage deeply, almost spiritually, with my materials and processes— listening to them, hearing their voices, and following their leads. R.J. Preece: What do you think about when you are working? Nnenna Okore: I think along these lines— natural synthesis, movement, schism, familiar, abstract, ephemeral, ethereal, bodily, earthy, fluid, enigmatic, and figural. A lot goes through my mind. But what I don’t think about is how the work should look in the end. It is very important that I let go of total control and let the piece form freely. Nnenna Okore. Wild seeds, (2007). LEFT: Installation view; RIGHT: detail. Clay, rope and leather. 90” x 28” x 21”. Installation view at Contemporary African Art Gallery, New York. R.J. Preece: How did you develop your craftsmanship? Nnenna Okore: Even with all my formal training, it goes without saying that my skills and broad understanding of crafts would not be as pronounced without the experience of growing up in my childhood environment. The exposure to people performing everyday tasks taught me a lot about basic skills, inventiveness, and problem-solving. R.J. Preece: Do you always make your own work? Isn’t there pressure to outsource certain tasks as the demand for exhibiting your artwork grows? 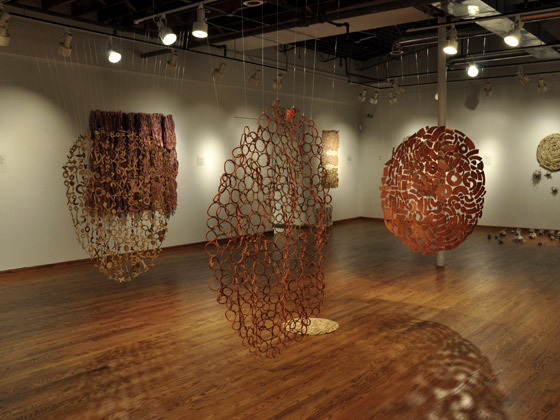 Nnenna Okore: For the most part, I have worked single-handedly, with the exception of Twisted Ambience (2009), which was completed with the help of an intern, and Lifeforce (2011), which was a collaboration with undergraduate students during my residency at Skidmore College. Of course, I have thought about outsourcing, but I have struggled with doing it, given that my processes rely so heavily on instinct and intuition. Still, it is imminent, and I look forward to seeing how my works evolve when other minds and hands are involved. R.J. Preece: After living in the U.S. for 10 years now, how do you see your work changing? Do any of your pieces reveal a bi-national identity through the selection of materials or forms? Nnenna Okore. Lifeforce, (2011). Burlap, paper, dye, latex paint and acrylic. 504 x 408 x 120". 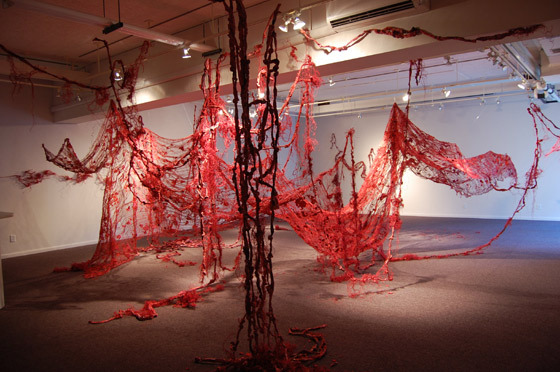 Installation view at Schick Art Gallery, Skidmore College, New York. Nnenna Okore: That’s a very good question. Before I moved to the U.S., my artistic approach and concepts were grounded in a cultural, political, and socioeconomic focus. I paid attention to issues and questions about cultural norms and idiosyncrasies associated with consumption and inventive recycling in Nigeria. Living in the West has allowed me to sever myself culturally, and perhaps emotionally, from my earlier perceptions and convictions. Increasingly, I have expanded my interest to include ideas about materiality and ephemerality. I am interested in understanding the role of materials and forms in shaping and defining our ecological landscape. I can’t easily claim to have developed a bi-national identity since relocating to America, though I should point out that the experience of living in two completely distinct worlds has broadened my visual sensitivity and aesthetic interests, steering me toward creating art with a more universal appeal. Nnenna Okore. Putting together things that fell apart, (2009). LEFT: Installation view; RIGHT: detail. Newspapers, sticks, clay and rope. 72 x 84 x 48". Carlson Tower Gallery, North Park University, Chicago. R.J. Preece: To what extent do you see your work, with its re-use of materials, as political? Are you stylistically, abstractly, referring to gaps between the consumption of the rich and the reuse of cast-offs by the poor in Nigeria? Nnenna Okore: I don’t ever set out with the intention of making political statements. Nonetheless, I am aware that there are political undertones. Sometimes I use Igbo titles to introduce some metaphors into my work and reflect on issues concerning poverty, social class, status, and wealth. R.J. Preece: Do you consider your subtle approach to be more effective than an in-your-face strategy? Is the visual experience more of a “discovery” than an immediately obvious identification? I first looked at your work with no accompanying text, but I did know that you had a piece in a sociopolitical African art show at the Middlebury College Museum of Art in Vermont. This created an interesting tension. Nnenna Okore. Omalicha (Intense beauty in Igbo), (2009). Clay and burlap. 40"x 60"x 8". Installation view at October Gallery, London. Nnenna Okore: Frankly, I am all for the discovery experience rather than putting it out there in your face. I am not suggesting that my approach is superior to those whose works spell “political,” but my goal, first and foremost, is to engage the viewer visually and provoke questions. My titles illustrate this; they challenge people to dig deeper in order to understand the essence of my work. Even then, I am not unsatisfied if they don’t. What matters most to me is the experience gained from my work— how viewers perceive it and what language it speaks to them. Irrespective of my intentions, the works will always engage viewers on many different levels— formally, conceptually, experientially, or abstractly. R.J. Preece: Could you describe the process behind Lifeforce? 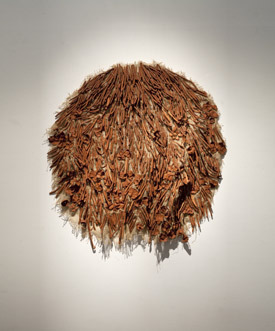 Nnenna Okore: Lifeforce began with unrolling several hundred yards of burlap, followed by carefully teasing, fraying, and shredding the material. This took several days. What I found most interesting about the experience was how reminiscent it was of those times during my teenage years when I spent long hours with other family members shredding tubers of boiled cassava on metal graters to produce enough food to last for months. The process of deconstructing the burlap in the company of others also felt very comforting and communal. After the fraying, the burlap was placed in a large bath of burgundy red dye, as were newspapers and magazines that had already been shredded and blended with the left-over burlap fibers. While the dye baths were left to sit for a few days, I twisted strips of newspapers and magazine pages together to create hundreds of long paper ropes, which were also dyed. The drying process was the final and most challenging part. Everything took days to dry because of poor weather. After almost a week, the dried pieces were moved into the gallery and installed. R.J. Preece: Do you intentionally use recognizable materials and forms, things that have specific associations and are familiar to Nigerians or people extending across Nigerian political borders? Nnenna Okore. 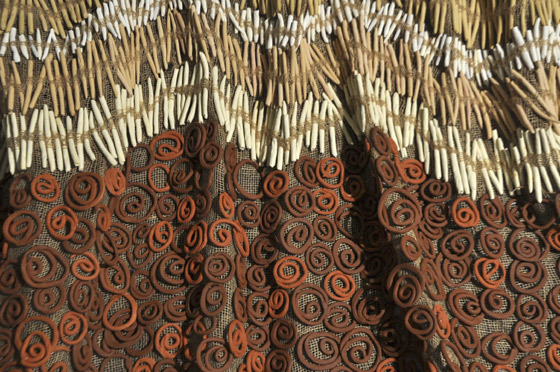 Omalicha (Intense beauty in Igbo), (detail) (2009). Clay and burlap. 40"x 60"x 8". Nnenna Okore: My materials, while recognizable to most Nigerians, are not necessarily representative of forms or values applying to any particular indigenous group. By virtue of its multiple functions, paper serves people in different ways and is appreciated for different reasons. For instance, among the educated elites, it is a symbol of knowledge, written expression, and pride. For the poor and less educated, the contrary is true— paper is valued mostly for its recyclable or utilitarian importance, especially during hard times. R.J. Preece: Does America sometimes freak you out with its consumerism and throwaway mentality? Nnenna Okore: Without question. I was shocked when I first arrived. Coming from a modest African background, I had never experienced so much abundance and indiscriminate wastefulness all at the same time. This might explain why my earlier works were so heavily focused on issues of wasteful consumption and recycling. R.J. Preece: Do you see your work as relating to nature and, if so, how? Nnenna Okore. Ulukububa (Butterfly in Igbo), (2008). 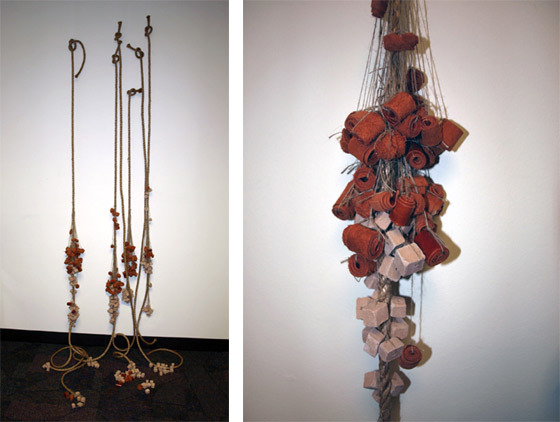 Clay and rope, 216 x 165 x 20 cm. Image courtesy October Gallery, London. Nnenna Okore: To a large extent, I do see my work as having some connection to nature or embodying the essence of nature. In my opinion, nature is a manifestation of uncontrollable phenomena. It supports a cycle of life that is dynamic and inexplicable. When I think of nature, I think of growth, aging, death, decay, and regeneration. These characteristics are evident in my processes and forms. R.J. Preece: How do you go about making your handmade paper? How did you get involved in it? Nnenna Okore: My paper-making process is peculiar in that it doesn’t employ the traditional materials used by most artists. I have adopted a combinative approach in which different materials, including found paper, jute fiber, dye, coffee, and lint, are pulped and reconstituted to produce rich, bodily surfaces. I cultivated a strong interest in the use of handmade paper in graduate school. I found its versatility and visual quality intriguing. It’s fascinating how different kinds of fibers of uncommon qualities can be churned together and flattened out to produce stunning biomorphic properties— that was simply mindblowing. R.J. Preece: Where do you collect your found paper? Nnenna Okore: Everywhere— in recycling centers, residential areas, recycling bins, libraries, from neighbors— just name the place, and I will be there. R.J. Preece: How did your training at the academy in Nigeria differ from art school in the U.S.? Nnenna Okore: During my year at Nsukka, the art school was known for its loyalty to Uli art traditions, combined with modern art practices. Most instructors inculcated students with the same thematic and stylistic principles that they had learned decades before, thereby producing a whole generation of young artists with an unoriginal aesthetic and visual language. I think that there’s a world of difference between the pedagogical approaches of Nigerian schools and American ones— many art majors studying in the U.S. are empowered to find and use their own artistic voices based on personal interests, convictions, and experiences. R.J. Preece: I read that El Anatsui was an important influence on your artistic development. Could you explain how? Nnenna Okore. Echi Di Ime (The Unknown in Igbo), (2011). 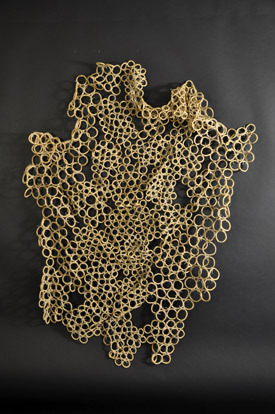 Clay and burlap, 91 x 91 x 5cm. Image courtesy October Gallery, London. Nnenna Okore: El, who was my professor, had an enormous ability to inspire. During my student years when I struggled with my creative path and traditional artistic practice, he showed me how to rely on my instinct and derive inspiration from my physical and social environment. I learned from him to use my mind, imagination, and experiences as the medium for creativity. I have taken these life lessons and run with them ever since. R.J. Preece: What would you describe as your other artistic influences? Nnenna Okore: I have many influences, but I am enamored of Arte Povera. The juxtaposition of different mundane and unusual objects, the synthesis of the natural and scientific, and the experiential atmosphere strongly appeal to my visual aesthetic and philosophy. I admire the impetus of the artists from this movement; they pushed materiality and the concept of impermanence to the limit. R.J. Preece: Has being an artist been an easy choice for you? Do you think it is more difficult for women in Nigeria, as opposed to men, to make this career choice? Nnenna Okore: My choice was passion-driven, and therefore fairly stress-free. It is generally difficult to sustain an artistic career in Nigeria, and more so for women. One of the main challenges for female artists in particular is a lack of moral or financial support. Unlike many aspiring female artists, I received and continue to receive tremendous support from family and friends. Believe me, it has made all the difference. I will be spending a year back in Nigeria, as a Fulbright scholar, doing some teaching as well as getting rejuvenated, reconnected, and inspired.